For the best views of Kuala Lumpur we headed to KL tower. It was pretty easy to get to. We took the monorail to Bukit Nanas and walked the 3 blocks to the bottom of the tower hill. From there we took a free van to the top. At the top of the hill we bought our tickets to go up the tower. Everyone stands in line for the elevators up. There is this beautiful crystal entry way before going up. The ride up took about 1 minute. The views of the city are pretty incredible. The kids loved posing in front of the green wall and looking through the binoculars. The binoculars are free to use. Here's what happens when you ask others to take your picture. How could someone possibly be that bad of a picture taker? We had a great couple hours at the tower looking around. Expensive, but it was a do once type of event. About 45RM adult, 30RM kids. 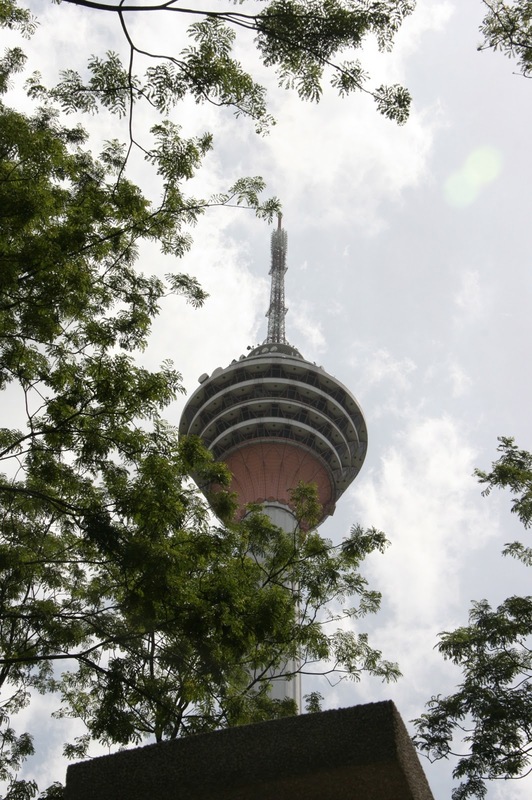 Besides the Observation Deck viewing they also have the forest in the city, the F1 simulator, pony rides, an animal zone and a Malaysia cultural village. Despite being a communications tower there is no free wifi. Bummer! Anyone else go to KL tower?